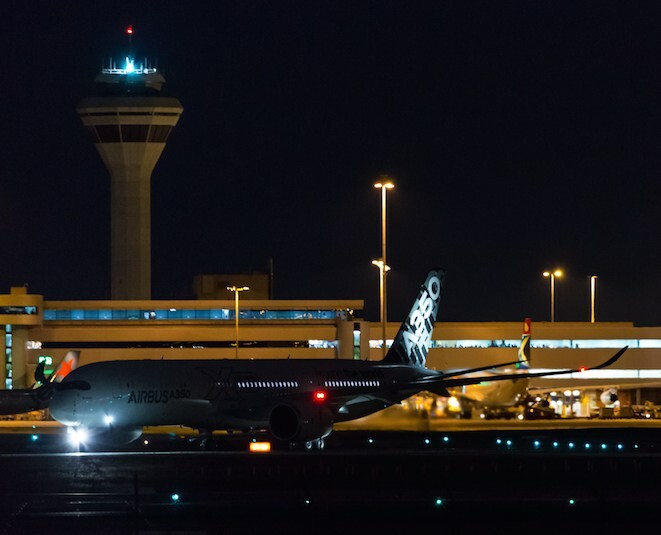 Airbus’s A350 has made its second and final visit to Australia as part of the aircraft’s route proving flight campaign. 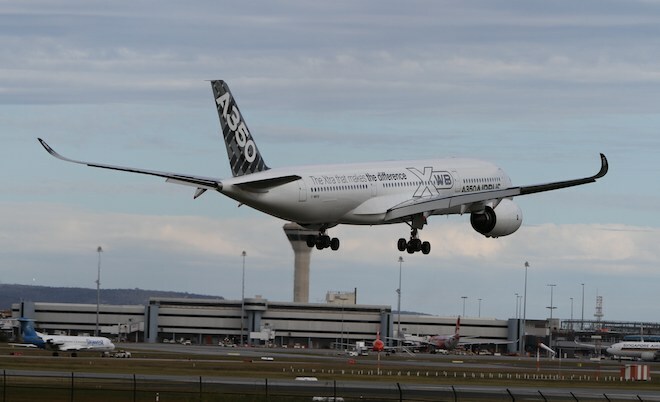 Development aircraft MSN5, F-WWYB, touched down at Perth about 15:15 on Sunday after flying in from Doha, Qatar, on the last of four route proving flights it has been undertaking to demonstrate the A350’s readiness for airline operations. After spending a few hours on the ground at the international terminal the aircraft departed Perth back to Doha at 23:10. From Doha the aircraft was due to continue on to Moscow and Helsinki, before returning to Airbus’s home base in Toulouse, France. On an earlier flight MSN5 visited both Sydney and then Auckland. Airbus says A350 certification is on track to be awarded before the end of September, with delivery to launch customer Qatar Airways due to follow before the end of the year. We couldn’t even go up to the International Terminal viewing deck to see the A350 parked at gate 56 – the airport corporation has finally started work on the terminal about 8 years too late and all is closed without transitional replacement facilities. Interest cost minimalisation through deferring action is the priority of course. Fortunately we found a dirt rise near the construction huts that gave us a view of all but the undercarriage. Yes, at times it is the Wild West! Pretty ordinary but at least the long overdue improvements will be completed – within 30 years according to the wrap around on last Saturday week’s “West Australian”!! Perth Airport,….sounds like Melbourne..we don’t have a viewing deck any more. They took it away! It’s almost impossible to see an aircraft at all at the international terminal now.